I recently finished reading a book called The Blue Fox, by the Icelandic author, Sjón. 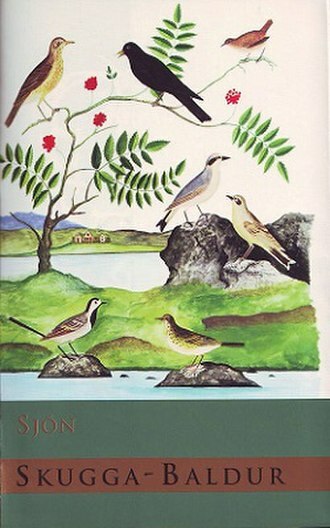 The book, titled Skugga-Baldur in the original Icelandic, was translated into English by Victoria Cribb. The book is short (the edition I read is just 123 pages), and I finished it in what was essentially a single read (I briefly set the book down to eat). First off, before any other commentary, I will say that the book was phenominal. Since stars seems to be thing to give or withhold, I’ll say 5/5. I base that rating on writing style, pacing and structure, depth of character and setting development, and overall composition. The first tells of a man on a snowy mountain, hunting a blue fox, the Vixen. The fox is as much a character as the man, and the prose is very nearly poetry. The second story follows a herbalist who, upon his return from Denmark, decides to shelter a young and very much abused woman with Down syndrome. As I say, the two stories are utterly intertwined, even if the connection is not immediately apparent. The writing style has been compared to folklore or mythology, and the comparison is apt. The hybrid story that emerges from the two sub-texts feels rooted deeply in time and in the landscape on (and at one point under) which the story occurs. And a note on translation is required also. I do not speak Icelandic, and so I can’t comment on how well the translation was done. I can say, however, that Victoria Cribb did a marvelous job of taking a work that (presumably) had an entirely different rhythm and structure, and building something marvelous in English. As a speaker of a few dissimilar languages, I know that it is very seldom possible to simply pick something up from one language and “English-ify” it. There is nothing Google Translate-y about this book. So, if you haven’t read it already, go find yourself a copy of The Blue Fox and read it. And if that whets your appetite, Sjón has written plenty more. I look forward to reading it. Now, for those of you who are thinking, “I would kill my own mother to win NaNoWriMo,” make sure you read the fine print. It’s actually a contest with yourself, a battle against your own inertia. Can you keep your ambition going and your fingers moving? To win, you need to type a minimum of 1667 words per day on average. And if those happen to be well-written words, all the better. Leoius saerilji aoale jojeojeu bamseuo—eqoiups saolesu epoku! A A A A A A A A A A A A A ! But a writer, even a sloppy writer, would probably not be happy with this sort of output. I hope to reach the 50,000-mark, and to do that, I’ll need to be content with a certain amount of systemic shoddiness. Nevertheless, I hope to produce something with at least a little literary virtue. If you’re up for the challenge, I encourage you to join me in NaNoWriMo. Registering is free, and can be done here. Remember, even if you find it challenging, it will all be over in 30 days. Think of it as an form of insurance against becoming James Joyce, who took 17 years to finish his final book, Finnegans Wake. You don’t want to do that. My story, Water, (which originally appeared in The Last Man Anthology by Sword and Saga Press) has been nominated for inclusion in the Wastelands Anthology. Got my fingers crossed! Here is a link to the page where you can find out more about the Wastelands project.